Kesa was originally made from old scraps of material donated to the priests. The scraps became finer and quite luxious in time. People who gave to Buddhist institutions were often keen to give very expensive items, so some fabulous kesas were created from wonderful silk brocades. This also could mean that the wealthier temples end up collecting the better fabrics or are able to send out for the expensive custom made kesas. 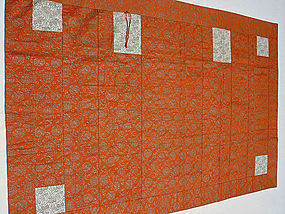 This kesa is hichi-jo (seven panel) kesa, silk brocade with silver thread (silver foil with paper backing), and cotton lining. Beautiful condition - some loose silver strips from the paper backings. Dimensions: 62" x 40 1/2".